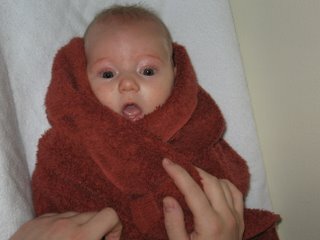 Kellie loves bathtime, but she despises the cold afterward. in our 80. degree. house. Pictured above is the first time Kellie wasn't upset about being out of the bath and on her changing table. I love the small changes. Well, think about it... her previous sleeping womb was a warm 98.6 degrees! A girl needs her comfies around her. Love the pictures - thanks for always sharing! Oh, the Praise I Sing For My Sling!